As the marketing world begins accelerating development of a new generation of automation, machine learning and AI designed to make their interactions with consumers more seamless and frictionless, a new study indicates the “pendulum” may already have swung too far. The study, commissioned by marketing webinar platform ON24 and conducted by Harvard Business Review’s Analytic Services, finds that most marketers already believe their push to automate customer experiences is turning consumers off. 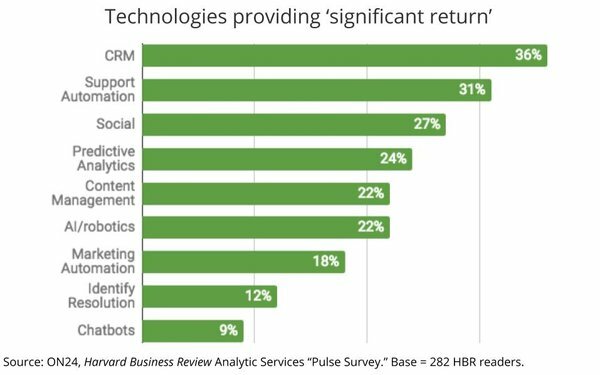 Not surprisingly, conventional CRM (customer relationship management) technologies are perceived to have had the most “significant return” on investment to date among the respondents, which were drawn from the readers of HBR. Automation customer services and support technologies were deemed the next-greatest ROI, followed by social media monitoring and communications management, but when it comes to pure-play marketing automation technologies, the effective return begins to fall off. Interestingly, chatbots -- which have become either the poster child or the running joke of marketing technology -- are perceived to have had the least ROI among the technologies queried. 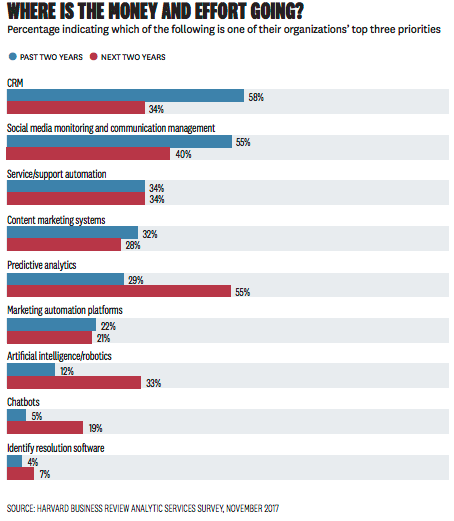 Among the technologies that respondents expect to make the greatest investments in over the next two years, predictive analytics leads (cited by 55% of respondents), followed by social media monitoring/management (40%), customer services/support automation (34%) and AI (33%).